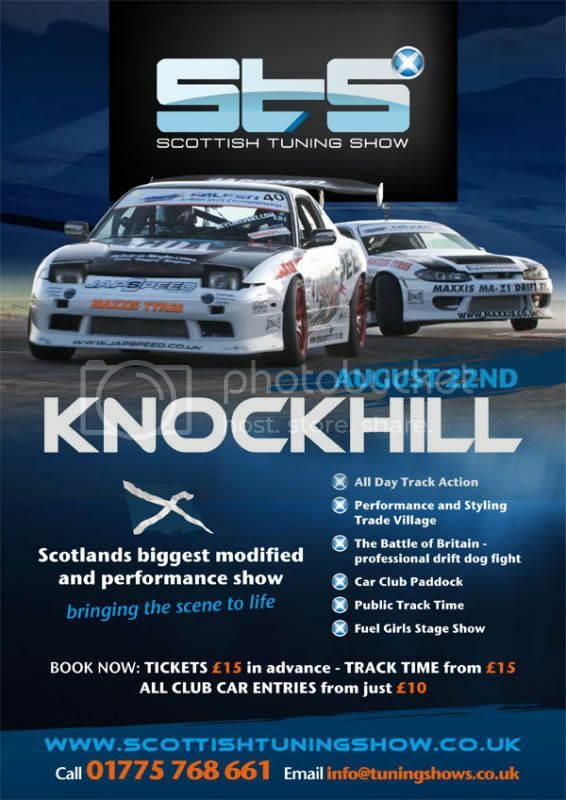 Tuningshows heads to Scotland’s famous Knockhill circuit for an action packed day on 22nd August 2010! • Car clubs - its just £10 per driver and £12 per passenger in advance (£15 on show day) . • Get in quick to make the most of our club deals - for every 10 cars get a driver ticket free. • Bring banners with you and get your club promoted around the circuit! • England V Scotland club DJ Battle – 2 clubs will go head to head. • Best club stand award. Individuals - come and join us for the day, show off your car, meet club representatives from across the UK. To book download a booking form on Scottish Tuning Show - The most extreme tuning show in Scotland or call Abbie on 01775 768661 ext 224. Park and Pose – 30 cars will get the chance to show off in our competition. To enter please send your details to info@auto-media.co.uk. Track Action – watch the Battle of Britain professional drift dog fight. • For track time fans why not race your mates with our special track time deal at STS. One car, one driver, one day! • Front seat passenger’s only – minimum height 4’8”. Catch the Fuel Girls on stage and the Kevin Carmichael stunt show. More details to follow but you can keep up to date by becoming a fan of “Scottish Tuning Show: the official page” on Facebook, or check out http://<a href="http://www.scottisht...show.co.uk</a>.